John Thurman lists the rolling hitch (also known as a Magnus Hitch) as one of the essential pioneering knots. 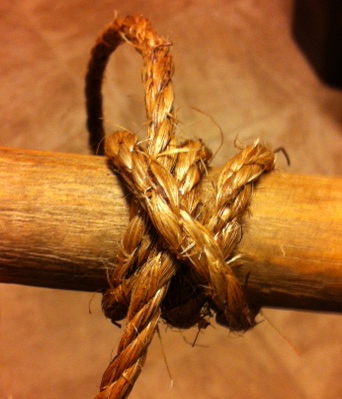 It’s similar to a clove hitch, but it’s a lot less likely to slip under a sideways pull. When securing a guyline to a horizontal spar, the rolling hitch can be used in lieu of a roundturn with two half hitches. It is also useful to attach a rope to another rope that has strain on it. Make sure that the direction of the pull exerted on the rolling hitch is against the double strand. As you become more involved in pioneering activities, you will find that there are many uses for the rolling hitch. After the roundturn is made, it supplies enough grip for you to complete the knot with ease, even when the line is under strain. Further adjustment can be made without completely untying the knot, by loosening the knot slightly, pulling the rope tight, and tightening the knot again. When the rolling hitch is tied to a spar, pull can be exerted either perpendicular to or along the length of the spar. After exerting heavy pressure, it will untie easily. When you need extra gripping power, just add extra turns. It works well with slippery or wet rope. When you want to tie a rope to a stake or a spar, the Rolling Hitch can be loosened easily to take up slack, and then retightened. 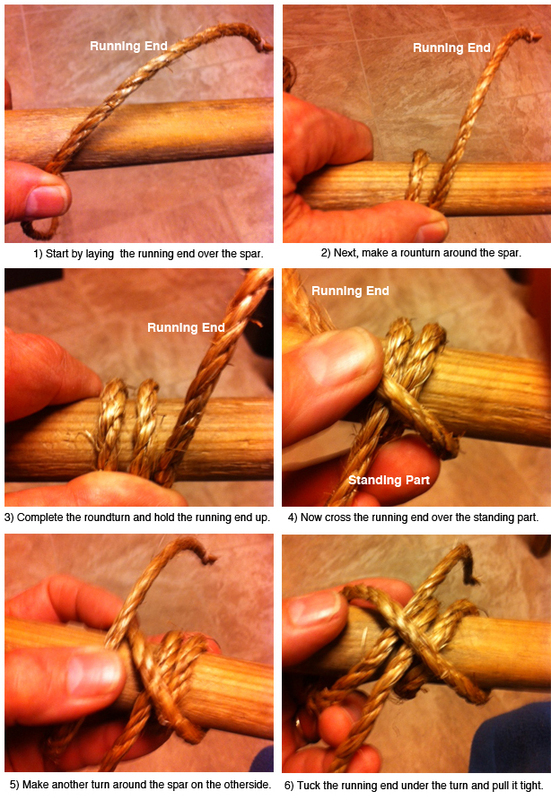 To attach a light tackle, double the rope over to form a bight, and tie a Rolling Hitch with a loop for the tackle (see figure 11). To form a hand or shoulder loop to pull a spar, tie two rolling hitches, one at each end of a short rope (see figure 12). The more you use it, THE MORE YOU’LL USE IT!